Welcome to the first comprehensive ski mountaineering guidebook for the Cascade volcanoes of California, Oregon, Washington, and British Columbia. The lengthy task of researching and writing this book began in the summer of 1999, and it remains a work in progress. I have compiled the information in this guidebook from many different sources, including published books and magazine articles, scientific journals, the World Wide Web, and my own personal experiences visiting each of the 28 included Cascade volcanoes. 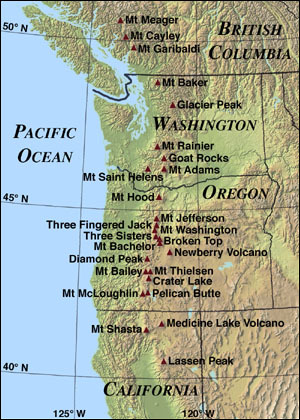 As of July 2005, I have skied or climbed over 150 different routes on all 28 of these volcanoes. Nevertheless, errors and outdated information may exist throughout the guidebook, and any use of this book implies acceptance of the disclaimer found at the bottom of this page. In particular, this online version is still quite incomplete and many pages have not been recently updated. Work also continues in parallel on a printed version of the guidebook for eventual publication (see the Preliminary Book Cover Design). The full-color PDF version of the printed book is currently over 300 pages in length, completely typeset and laid out, including photos and 24 large topo maps. I will be adding low-resolution versions of these topo maps to each of the volcano web pages listed below, but approach road info and detailed route descriptions will appear only in the written book. However, the web version will list every ski route included in the book (over 250 at last count) and will eventually have many more photos than can fit in the printed book. In December 2003, this section of the website was upgraded to use a MySQL database and PHP scripts to dynamically generate and serve the pages for each individual volcano. This long-awaited behind-the-scenes improvement should result in significantly easier updating of the content of the website. If you have skied any of these peaks and routes, I would appreciate your feedback regarding the content of this guide. My contact information can be found here. or from the list at right. Skiing, snowboarding, and mountaineering are inherently dangerous activities, and all of the trips and activities described in this online guidebook carry the risk of serious injury or death. Anyone who is not an expert in skiing, snowboarding, and/or mountaineering should use an experienced, qualified guide or seek qualified instruction before engaging in any ski or snowboard mountaineering. This online guidebook is a compilation of information gathered from many different sources, including but not limited to the author's personal experience. The author can not guarantee the accuracy of any of the information in this guidebook, including route descriptions, ratings, and topographic maps. You should not depend on any information contained in this guidebook for your personal safety. Your safety depends on your own good judgment, based on experience and a realistic assessment of your skiing, snowboarding, and climbing ability as well as weather and route conditions. If you have any doubt as to your ability to safely ski, snowboard, or climb any route in this guidebook, do not attempt it. Your use of this online guidebook indicates your assumption of the risk that it may contain errors and is an acknowledgment of your own sole responsibility for your safety.